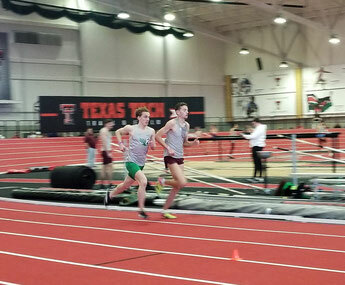 At the Texas Tech Classics in Lubbock, TX, I won to my first track meet in the USA. For the first time in this season, I competed over 3000m. As usual, the goal for my race was to run as fast as possible to secure a spot in the first heat of the C-USA Championships. This race was with 19 competitors quite big, but thanks to an aggressive start of my teammate, the group spread out right from the start. Our first Kilometer war on pace (2:49) and I felt really comfortable running it. Then another runner took the lead and instead of pushing it, he slowed the pace gradually down and it took me quite a while to realize it. At the 2000m split, I realized that we are already several seconds slower than planned and I started to push the pace. Only one athlete from A&M was able to keep up with me for a while but with one lap to go I saw on the video screen, that I was on my own and I won the race in 8:33. Even though, this was not the fast time I was hoping for, I am pretty satisfied with today's race. In the past few week, my workouts have not been outstanding and following that, it is nice to see that I have a decent fitness. Obviously, I should have pushed the pace a bit earlier but that's part of racing. Despite the imperfect pacing, I was still faster than last year at the same meet where I finished 3rd. Now, I have three weeks for some good training to prepare for the C-USA Indoor Championships in which I will race the 5000m and 3000m.